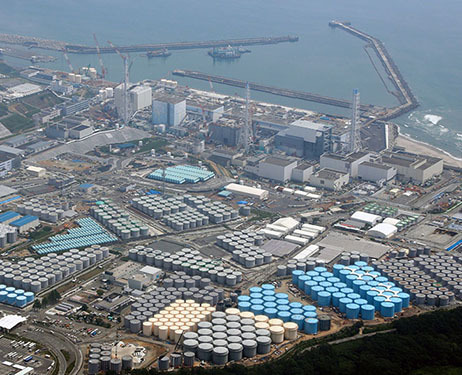 Fukushima today, with hundreds of tanks holding radioactive water. Asahi Shimbun file photo. 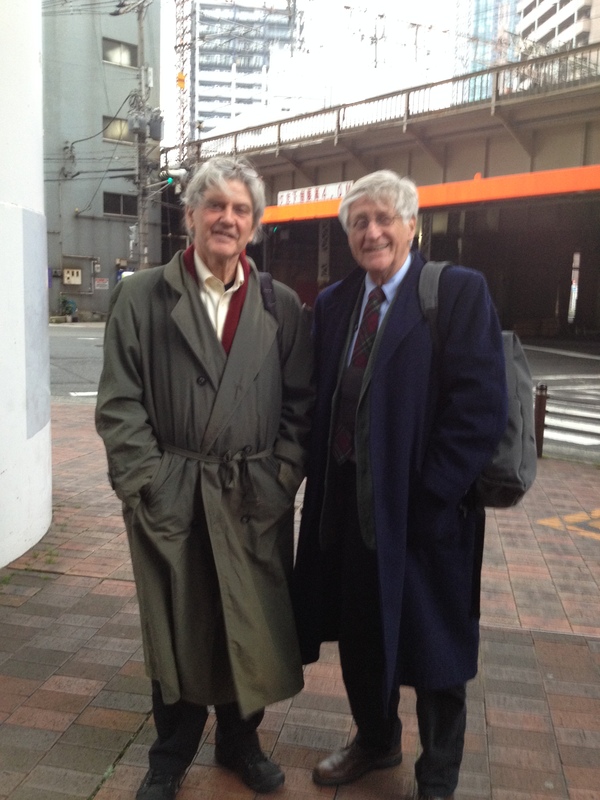 As the fifth anniversary of the onset of the continuing Fukushima nuclear disaster approaches, Mary Olson, director of NIRS Southeast office in Asheville, NC and Arnie Gundersen of Fairewinds Associates are on a five-week speaking/listening tour of Japan. We will be posting Olson’s “tour diary” beginning today and continuing with new posts through March 11, the day the disaster began. I have been to speak at the global Humanitarian Impacts of Nuclear Weapons in Vienna (December 2014) and the Nuclear Nonproliferation Treaty Review at the United Nations in 2015. Now, finally I am here in Japan for a five-week speaking tour during February and March 2016. Arnie Gundersen of Fairewinds Associates is here too. In 2011, in the week that this nuclear disaster began, I became consumed by a question that women (3 or 4 of them at various public speaking events) had asked me: is radiation more harmful to women? This question had, at the time, made me deeply uncomfortable; for 20 years I had been serving as an educator and networker for grassroots people impacted by the nuclear industry and its spewing of radioactivity. I had sat at the knees of so many icons of radiation protection (Gofman, Bertell, Stewart, Morgan, Wing, Caldicott) that I was confused. I had never heard of gender as a risk factor, and indeed, it had never occurred to me to ask. So the events of March 2011 suddenly made this matter urgent. I found the answer: yes, gender is a risk factor! It is highly significant (100% difference) in young children, birth to five years where exposure results in cancer, at some point in life, twice as often in girls exposed to ionizing radiation compared to boys exposed in the same age group and radiation level. How do we know? The National Academy of Science printed 60 years of data taken from the horrific events of 1945 when our US government used indiscriminate force (A-Bombs) on cities full of people. From the horror of the destruction of Hiroshima and Nagasaki comes the only data set (big) that has both genders and all ages. There are many problems with this data, but from the atomic ashes comes the very important news: we must protect little girls 10 times more than the “Reference Man” currently used in standard-setting. Independent from my analysis, the same finding has been confirmed three times, making it “settled science.” Adult women are also harmed by radiation more than adult men: for every two men who died of cancer after exposure, three women died. To me, even now at 58 years old, 50% is a lot! Steve Leeper (left) and Arnie Gundersen (right). I am here to listen, and to share this news here in Japan. Arnie Gundersen is here to speak, listen and collect data. Our primary host and co-presenter/MC is Steve Leeper, recently retired from the Hiroshima Peace Foundation and now establishing a training center for Peace Culture near Hiroshima. We have had tremendous support from many networks, including the Buddhist network of Mori-Jushoku, Aileen Mioko Smith (Green Action), the YMCA of Japan and many, many others. I feel like a rock star who jumping from the stage above is carried on the hands of many in the crowd. Pretty amazing….maybe most of all is the incredible service of a pack of women translator/interpreters who have made communication happen. I hear these words as we leave the Temporary Housing community room, our first stop in the Fukushima Listening Project which is to prepare us for the next four weeks while we are on a speaking tour here in Japan…later when I share this with my sister, via Skype, we both cry for a long time. I met this small group of women 4 years, 11 months, and some days since they were forced to immediately leave their homes, many with only the clothes they were wearing. As they left, they were already bathed in fission products from the atomic disaster unfolding nearby at the Fukushima Daiichi nuclear station. Like “9-11” in the US means the day of the World Trade Center and Pentagon attack, here “3-11” refers to the Tohoku quake, tsunami and Fukushima Daiichi meltdowns. Now, almost 5 years since 3-11, we are here, in the Koriyama area where they still live. We were invited here to listen. The women suggest that we ask them questions. How to break the ice? So I begin by saying I want to hear about their two homes…where they are living now, and also the home they had to leave. They ask me if I mean “house?” I affirm again that I mean “home,” illustrating with a hand on my heart. As the first speaker bravely begins, our eyes meet and we both begin to cry. We do not rush this moment…we connect deeply…others tear up too…real listening begins. 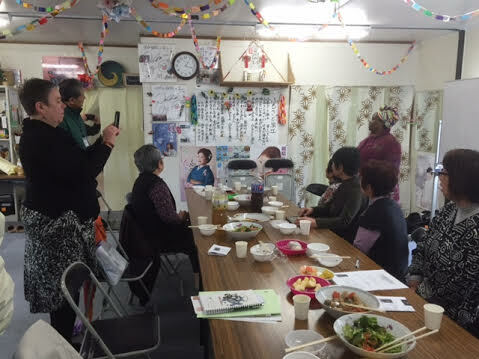 The women have a song about their home in Namie, which they had to leave suddenly, 5 years ago, under the plume from three melting reactors at Fukushima Daiichi. They close our meeting by singing this special song. None of these women had any idea when they left that five years later they would still not be home. Most are allowed to visit their homes up to 30 times a year, but some of these visits are only for a few minutes because the radiation remains so high. The levels of contamination are a patchwork; some property has lower levels and one of my new friends spends a couple of afternoons a month at home. Of 12 women I am meeting with, one has been officially informed that she can never go back, the level of radioactivity around her home exceeds any official plan to remediate. She sits quiet, it is apparent that her experience is quite different from the women who believe that the day will come when they can return. I am silently relieved that these women are grandmother-aged…but I know that some areas are soon to be officially declared “OK” and that families with children are expected to return. If they do not, they will lose what benefits and support have been available to them…but there is also no one who would buy their homes. Really a bind. Another, a teenager, has not been allowed into the exclusion zone at all. I support this official protection of the young. She was 12 in March of 2011, next year, when she is 18, she can go. She says she will go; once. Tea Party is a support group for women. Sometimes a guy will come, but not today. It is nearly incomprehensible to me that I am the first person to talk with these women about the danger of radiation, and small ways they can reduce their exposures. Then, I remember: the invisibility of radioactivity is so convenient. We are a species that invented the statement “seeing is believing” and the invisibility of this muta-carceno-teranno-gen makes it so easy for the “There is no problem” propaganda to take hold. When we can’t see it, we don’t believe it. With radioactivity there is no taste, smell or other clue of danger, which is also very convenient for Tepco and local, state and national officials seeking to limit liability and direct costs of this unnatural hazard. As we sit together around folding tables in the community room of these temporary housing units (very much like a trailer park where I live), the ice begins to melt and the women begin to tell stories. As each shared a slightly different story, this patchwork of radioactivity in this region became visible in the ways in which these lives have been disrupted. One woman’s empty house has been cleared by official cleaners as “OK,” and maybe she can move home before long, but she is deeply concerned about radioactivity in the drinking water. The water service is from a reservoir where the watershed is forested slopes where the radioactive plume deposited a lot of Tepco’s radioactivity. She is right to have a concern: part of our “posse” are people who do environmental sampling and 2 days before they happened to see a wild monkey defecate; a sample of this fresh monkey dung read 50,000 Bq per kg! For those who are not sure what this means, before 3-11 it is unlikely that a monkey turd would have more than a couple stray Bq. It is true that there is a lot of water in the reservoir, but when this water is primarily from rain that has fallen on radioactive trees, plants and soils, it is likely that the drinker of such water could also have radioactive poop. I told her to be very careful about the water she drinks, bathes in and particularly what she uses to grow food. 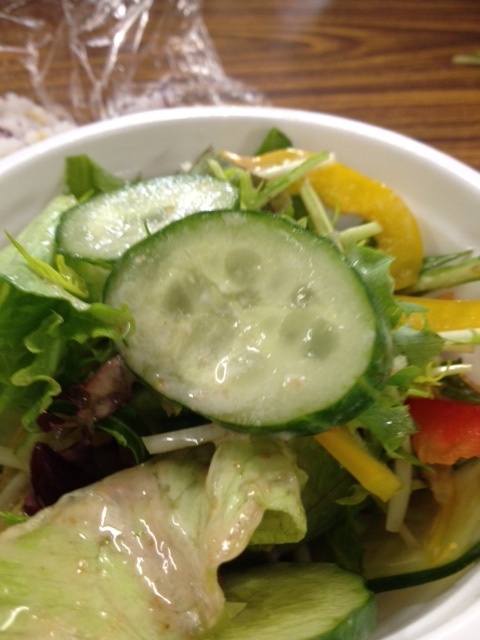 I notice that the cucumber on my salad looks a bit mutated. The women are taken aback. They wonder about me eating it. I say “this is genetic damage that probably happened before. I don’t think it is contaminated now.” Arnie jokes that I should send this photo to the researcher from University of South Carolina, Dr Tim Mousseau who studies the plants and animals from this area. Since the cucumber probably came from the open market, who knows its actual origin? I understand, immediately, that it will be nearly unthinkable for these women to now, after 5 years, put on ugly hazmat suits or to wear a mask all the time in the homes they are told are being cleaned. So I offer another idea: pick some special clothes; clothes you wear only at your house. Get some special shoes too. Keep them separate and do not wear them where you live now (temporary housing). Wash these clothes separately too. This is a small thing, a little effort I tell them that could make a big difference for their health. I tell them it would be better not to eat inside the Zone at all, but their practice of bringing food from the store and keeping the food in their car in packages is good, and if they lay the food out they should bring a new plastic picnic cloth to put the food on…wash their hands before eating, and then throw the plastic sheet away. I want to tell them that I do not think they should go to their house…even if they are told their house is “OK.” But there are many places here, in unrestricted areas of the Prefecture, where our monitoring team has seen levels 50 and 80 times usual background for this area…and particles that are “through the roof” hot… I am faced once again with depth of incomprehension that a nuclear meltdown’s impacts produce…So, I say nothing. This year, 2016 is Chernobyl+30. This notation was developed by people who understand that nuclear disasters may start on a particular day, but they do not have an end-date in terms of our lifetime, or even human history. Chernobyl is still the reason, 30 years later, that food cannot be produced in some parts of Wales, Scotland and Ireland…wild boars cannot be eaten in Germany, and mushrooms remain off-limits in many regions… What can I say to a displaced grandmother that will make sense? Another woman told me she has moved seven times in these five years. Her husband has died during that time, her children have moved away and she is alone now. The world is adrift in displaced people, every one tragic, but perhaps none more tragic than these radioactivity refugees. The force that was released as the Tohoku quake of 2011 literally shook ‘Spaceship Earth,’ measurably shifting the angle of Earth’s axis…but the shift in axis of these lives (and nearly 100,000 others who are still displaced because of the nuclear reactor going out of control) is so, so very much greater. As I was leaving I said to the dozen women displaced, some permanently, by the radiation still present from Tepco’s nuclear disaster, “Thank you for sharing your stories with me today,” I will carry you in my heart.” I was shocked by their reply: “You are the first person to speak with us about radiation.” They promised me they would take small steps that may reduce their radiation exposure. Your contributions make publication of GreenWorld possible. If you value GreenWorld, please make a tax-deductible donation here and ensure our continued publication. We gratefully appreciate every donation of any size. Comments are welcome on all GreenWorld posts! Say your piece. Start a discussion. Don’t be shy; this blog is for you. If you’d like to receive GreenWorld via e-mail, send your name and e-mail address to nirs@nirs.org and we’ll send you an invitation. Note that the invitation will come from a GreenWorld@wordpress.com address and not a nirs.org address, so watch for it. Or just put your e-mail address into the box in the right-hand column. If you like GreenWorld, help us reach more people. Just use the icons below to “like” our posts and to share them on the various social networking sites you use. And if you don’t like GreenWorld, please let us know that too. Send an e-mail with your comments/complaints/compliments to nirs@nirs.org. Thank you! Thanks to Mary so much for this! I have always believed that “making things personal” makes them more powerful, & this tour is exactly about making it personal. Making it understandable at the level of real people in real situations. I’ll share widely. Reblogged this on red kimono. Thank you for this reporting. Do continue your works. Thank you so much Mary! I’m glad you spared time for this while meeting people in a packed schedule. For this again, you are the first person who is doing this; sending true stories of people from Fukushima about what they experienced and what they do, feel now.